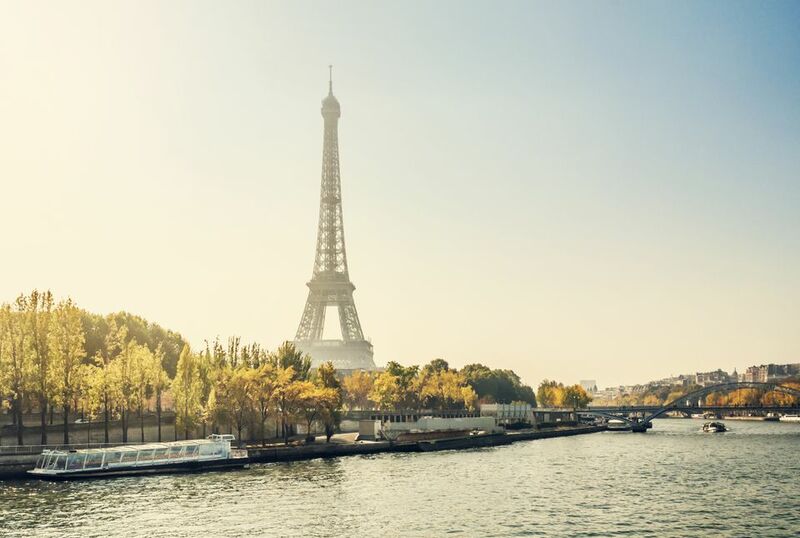 Although the month brings colder, wetter weather to Paris, October is one of the best times to visit the French capital, especially if you're hoping to avoid crowds and save money on airfare and accommodations this autumn. It may be on the wet, overcast, and brisk most days, but October offers visitors opportunities to take meditative strolls in the crisp fall air, to enjoy long afternoons chatting or reading in traditional cafes, and to bask in dramatic, dusky skies among picturesque settings. Since tourist season begins to ebb in late September and throughout the month of October, the city gets quiet this time of year, but there are also still plenty of events throughout the month like the Nuit Blanche (White Night) celebration that sees museums, galleries, monuments, and national sites open all night in honor of French culture. Temperatures in Paris constantly drop over the course of the month, though there are a few occasional warm, sunny days in October each year. While the city rarely sees temperatures below 48.2 degrees F (9 degrees C), it also doesn't get any warmer than 60.8 degrees F (16 degrees C), and the average temperature in October is just 51 degrees F (11 degrees C) throughout the month. October in Paris is generally chilly and damp. Rain is common and usually occurs at least 15 days out of the month, accumulating an average of over two inches each year. As a result, October is generally best-suited for indoor activities like visiting exhibits at Paris's many fine museums or people-watching from inside a warm, cozy cafe; however, there are a few warm days in the early part of the month, a phenomenon known as the second summer. Since you can generally expect rain throughout the month, you'll need to bring waterproof shoes, a raincoat, and an umbrella if you hope to stay dry. Colder weather also means you'll want to bring long-sleeve shirts, sweaters, and possibly an overcoat as well as long pants and close-toed footwear. You should also plan to layer cooler clothing under your sweaters and coats just in case you happen to experience a random warm day that occasionally happens in the city's "second summer." While the summer tourist season may be long gone by October, that doesn't mean Paris nightlife or local attractions take a break from serving up unique events, celebrations, and opportunities to discover the culture, history, and romance of the capital of France. From wine-tasting weekends to wandering through pristine settings all month long, these events are sure to entertain and delight on your trip to Paris this October. Nuit Blanche (White Night): An annual event in which hundreds of Paris sites—​including museums, galleries, and monuments—stay open all night, allowing for some promising cultural discoveries and surreal nocturnal itineraries. Events take place on October 6 to 7, 2018. Vendanges de Montmartre (Montmartre Wine Harvest): The village-like neighborhood of Montmartre celebrates its annual batch of Paris-made wine with community events, wine tastings, and parties, which will take place from October 10 to 14, 2018. Jardin du Luxembourg: Perhaps one of the best places in the city to take in nature this month, you can amble through lanes of trees crowned with fiery orange and yellow leaves at Jardin du Luxembourg all month long. International Contemporary Art Fair (FIAC): This annual event takes place from October 18 to 21, 2018,​​ features over 3,000 works from 180 international galleries, and is attended by some of the most influential artists and critics in the contemporary art scene. Festival de l'Automne (The Autumn Festival): Since 1972, this annual three-month-long event (late September through December) celebrates the fall season with programs and showcases dedicated to music, cinema, theater, painting, illustration, and other forms of contemporary visual arts. You'll likely have more space to wander and truly enjoy Paris' fine museums and galleries. Strolling through one of Paris' many elegant parks and gardens on a sunny day can be a memorable experience this time of year. Shopping in Paris is also less of a headache in the fall than it is in the summer. You likely won't have to put up with long lines and overcrowded stores. Since it's the shoulder season for tourism, prices for flights should be cheaper throughout the month, with the exception of the weekend before Halloween. Day trips and continued travel across Europe is quite simple from Paris, especially if you take the high-speed rail at Rail Europe.